The use of senior care reputation management is crucial in the industry. More Baby Boomers are retiring and their children look online first to find the best care available. One way facilities can distinguish themselves from the competition is by maintaining a positive reputation in their online reviews. In fact, our research shows that 82 percent of those looking for assisted living facilities will read online reviews as part of their research process. Online reviews also have financial benefits. 73 percent of people in the same research study said they would pay more for an assisted living facility with positive reviews and reputation. Creating a favorable online reputation sounds daunting at first, but have no fear. We have some senior reputation management tips that can help you attract potential residents as well as some of the best hires from within the industry. The search process for the best senior care is intimidating and stressful. One way consumers will decide if your facility is the right choice is by how you react to reviews. Before responding to feedback, think about the reviewer’s state of mind. What made them curious, happy, or angry about a specific aspect of your facility? Do they think you’re treating their loved one with the best care or are you lacking in some areas? Once you figure it out, respond in a kind manner. Don’t escalate the issue to a point where you can’t control the outcome. There might be some pre-approved lines for you to use when responding to specific comments, but try to make them sound natural. People want to get a response from you. Just make sure that you sound sincere and caring for every review. Another facet of senior care reputation management requires you to have the right information on hand. Providing correct and accurate facts in your responses makes you an authoritative figure, which can increase the trust and confidence a potential resident places on your business. However, you shouldn’t try to correct everything someone says in a negative review because it might backfire on you. In these situations, it’s best to find a way to resolve their issues away from the public eye. Some solutions include setting up a private phone call, corresponding by email, or sending them to your help desk service (if you have one). This type of redirect is also beneficial in regards to the HIPAA privacy laws. Whether your reviews are favorable or negative, it’s important to thank people for their feedback. After all, they took time out of their busy daily schedules to write feedback. Saying “thank you” is one of the easiest things to do, but it also carries plenty of weight. It shows that you care about their feedback, and sets a positive tone for future conversations. Prospective customers can easily see your positive tone from a few exchanges, and that might be enough to convince them to learn more about your facility. Having a positive reputation isn’t just for your potential residents. It’s also an effective way to attract more people to your team. The demand for caregivers, nurses, and coordinators is high, and you need to find ways to stand out. With the right staff, you can create a culture where people are proud to work in your facility. They become ambassadors of your company brand, which can attract a higher number of potential employees. One piece of research shows that 94 percent of job seekers will apply for a job if that company actively manages its employer brand. Another study shows that companies with positive employer branding get twice as many job applications. Consider the idea from a financial perspective: with an effective employer brand, companies have a 28 percent increase in retention and a 50 percent decrease in the cost per hire. Teaching employees about your brand gives them a stake in its success, which can lead to increased motivation in the workplace. That type of positive environment can bring favorable employee reviews on websites like Indeed and Glassdoor. Senior care reputation management and employee branding are part of an effective business strategy cycle. With the right response methods to reviews, you create a positive reputation for your facility. This, in turn, allows you to create employee branding that makes people proud to work with you. 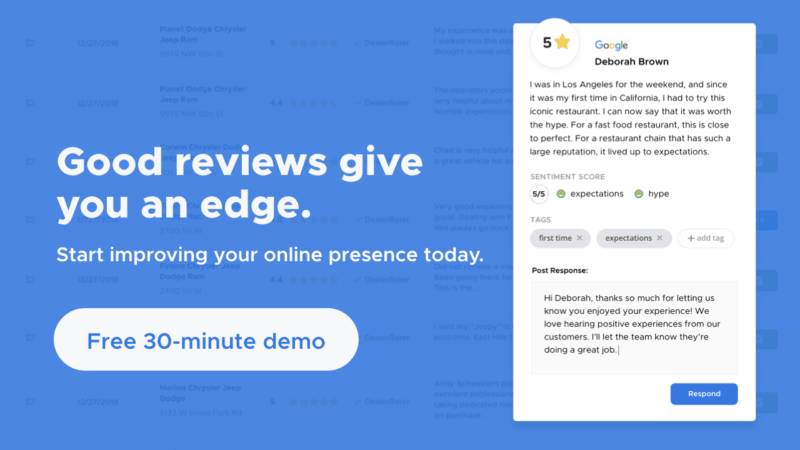 Reviews left by employees contribute to your overall online reputation, which can attract more applicants and creates a better hiring process. The tips above should be enough to get you started, but if you want to make it easier on yourself you can use reputation management software like ReviewTrackers to manage the many aspects of your senior care facility. Start with identifying what you need, as to whether you wan a facility that provides 24*7 care, or a facility that offer care along with amenities such as Housekeeping and laundry services, Daily activity schedule and convenient any time dining for its residents. The determine the locations that match your needs and lastly evaluate locations using multiple resources.